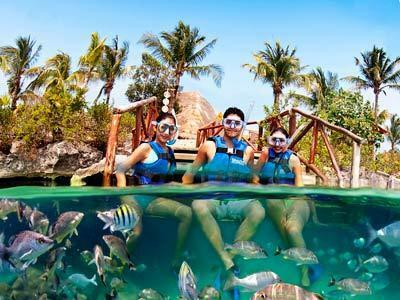 The Xel-Ha All Inclusive Tour with Transportation takes you to a beautiful water park in the Riviera Maya that boasts the most impressive natural aquarium in the region. Popular for its floating bridges, rock formations, and incredible array of colorful tropical fish, the park also features streams, cenotes, caves, and a lazy river. For an additional fee, you can also swim with dolphins, walk along the sea floor, and get up close to manatees and rays! The array of activities that you can do at this family-friendly park is incredible, ranging from snorkeling and taking an inflatable down the lazy river to exploring caves. There is also a glass-bottom boat, a special area for children, and guides that will tell you more about the park and its endemic species. The park's All Inclusive plan allows you to leave your wallet in your locker and enjoy delicious food and drinks in its restaurants and bars, before heading to the hammock area to unwind. If excitement is more your thing, then there are rock formations to climb and jump off of, as well as thrilling zip-lines. Come and discover all this fantastic park in the Riviera Maya has to offer when you book the Xel-Ha All Inclusive Tour with Transportation!